EDMONTON (2015 FIBA Americas Women’s Championship) - The national teams of Puerto Rico and Venezuela are matching-up today for the 2015 FIBA Americas Women’s Championship fifth place and the last ticket to the FIBA Olympic Qualifying Tournament next year. Put in simple terms: the winner keeps alive its dream of participating for the first time ever at the 2016 Olympic Games in Rio de Janeiro. Puerto Rico came to this competition with a lot of uncertainty, given the absence of their best player and guard for the past years, Carla Cortijo, in a topic of permissibility to participate in the WNBA, a situation that still rumbles on the Caribbean island since the start of the tournament. However, the Puerto Ricans have not lost their hunger and dedication, showing discipline in their victories on the last two games of the group stage, against the Dominican Republic and Chile, confirming that it is a team that has been growing in the championship. The contribution from the guard, Jennifer O'neil, coming off the bench and averaging 13.3 per game, has been key to their growth. O'Neil sums to the contribution from Sandra Garcia with 10.0 points per game and veteran, Mari Placido who averages 9.5 points per game, in addition to leading the team with 6.8 rebounds per game. Meanwhile, Venezuela is a team that reached the competition with the clear goal of fighting for the last ticket to the FIBA Olympic Qualifying Tournament next year and the team is one step away from achieving it. 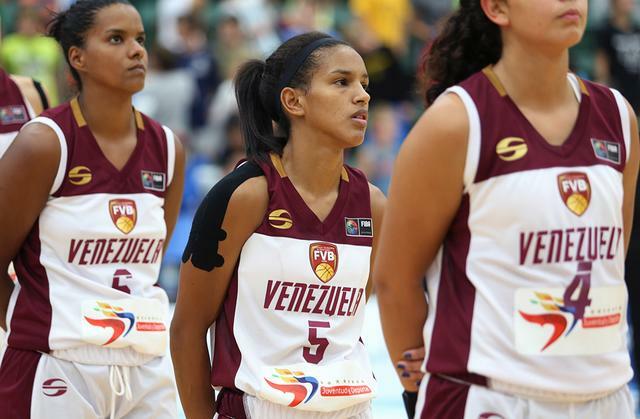 The key for the Venezuelan team has come from the hand of one of the stellar performances of this 2015 FIBA Americas Women’s Championship, their forward Roselis Silva, who leads the team with 15.8 points per game. Silva is accompanied by the contribution in the paint from Yosimar Corrales and the veteran, Ivaney Marquez, who led the team with 15 points in the 55-48 victory over Ecuador, last Thursday. Both teams have come from less to more in the competition and seek the pass to a second chance to qualify for the Olympic Games next year. The match for fifth place of the 2015 FIBA Americas Women’s Championship will be played at 13:15 (local time of Edmonton). All matches of the FIBA Americas Women’s Championship will be on TV in the following countries and on the web through livebasketball.tv, in a payment service. For the most comprehensive coverage of the 2015 FIBA Americas Women’s Championship, visit fiba.com/Americaswomen2015 and follow us on social networks @FIBA to keep up with the latest information of the competition.